I am awakened by the thoughts that two years have past. My eyes have glazed over and only for brief moments are cleared. I continue to ask, who am I without you? The past two years seem cloudy in my head and I wonder if I'll ever truly wake. It seems like it was just yesterday when we read lines together for Angels Fall and you and Elizabeth annoyed me with your uncontrollable laughter. Now I think twice before I tell someone to stop what they are doing because they are annoying me. What I wouldn't give to come home late at night to see you watching TV next to Mom. I miss seeing you across the dinner table and you and Grandpa teasing each other. The swim parties and birthday parties always have a missing link but a candle lights your place and we know your spirit we always be near. All our bonds have grown tighter to hold each other together. I thank God for the memories of those moments so when I close my eyes I can see all the things I miss. Never once did I think I would be helping to organize dance showcases and walks. But the chance to gather with family and friends for those events of celebration, bring momentary peace. When the people you touched come together to honor you, we know you are still near. What you did with seventeen years here amazed me and I am amazed at what you have done these past two years. You've given me the strength to fight through the hard times and never stop reaching for my dreams. You have taught everyone who knew you to not be burdened with meaningless worries, to cherish the people in our lives, and that life's fragility means we are truly, only one breath away. Kathryn's love of children and hopes of teaching inspired KBMF to make a donation to the DuPage Children's Museum. The donation will help to nurture the minds of all children who visit the museum. Upon receiving the donation, the museum will hang a plaque in their ?all of celebration in memory of Kathryn. Kathryn's plaque will read: ?athryn Mary Bender, 17 treasured years. There will be a picture of the plaque on the website when it is completed and hung at the museum. In June of this year, 19 months after Kathryn's passing, the Bender family received a very touching letter from someone very special. As you may know, Kathryn was a tissue donor through Gift of Hope. When she passed, Kathryn helped many others with her decision to be a donor. "...I am writing to thank you for the kind and generous gift of tissue donation from your loved one. I am so sorry for your loss but I want you to know that your decision to donate has changed my life in a very positive way..."
We are grateful to the recipient for sharing their inspiring story with us. We were touched to hear of another life that has been changed for the better because of Kathryn. By being an organ, tissue and eye donor with the Gift of Hope, the donor's family is invited to participate in an annual "Day of Hope and Remembrance." This year, the event took place at the Wildlife Prairie State Park in Hanna City, IL. The day consisted of a Potluck Picnic which was followed by the Ceremony of Hope and Remembrance. During the Ceremony, Kathryn's name was one of many to be read aloud. Following the ceremony, the attendants gathered to scatter wildflower seeds in the park in memory of loved ones who gave the gift of hope through organ, tissue and eye donation. KBMF has recently awarded their second year of scholarships. In May, the Naperville North High School scholarship entitled the "Kathryn Bender Performance Award" was awarded to Grace Pillari. The two KBMF dance scholarships were awarded in June at the STEPS Dance Center end of the year recital. The "KBMF Dance Scholarship" was awarded to Melissa Pallardy and the "KBMF Senior Scholarship" was awarded to Elizabeth Betten. Congratulations to Grace, Melissa and Elizabeth. We wish you the best of luck in the upcoming year! Our 2nd Annual Kathryn Bender Memorial Dance Showcase was held on May 16th at the College of DuPage. It was another great success with a crowd of almost 400 people. New fundraising options this year included our Chocolate Thursday Cookbooks, showcase t-shirts and the option for the performers to buy ? price tickets. And, like last year we still offered, flowers, DVDs and raffle prizes. We had eleven dance companies from the surrounding area perform in the showcase. In addition to those dances, Kathryn's friend Elizabeth Betten choreographed and performed a piece entitled, "Every Moment." And in honor of Kathryn, her sister, Elizabeth, and brother, Nicholas, danced to, "Breakfast Table," by Chris Rice. Next years showcase will be on Friday, May 23rd, 2008. For more information, please check our fundraisers link on our website, as it will be updated regularly. Please mark your calendars and spread the word! We look forward to seeing you next May! As the holidays are approaching, remember Kathryn's Chocolate Thursday's Cookbook makes a great gift idea! They are currently available at Anderson's Bookshop in downtown Naperville. We also have an order form available for your convenience on our website. The 1st Annual 5K Walk/Run was a big success. We had over 175 people attend! The weather was a little overcast during check in but it ended up being a great morning to go for a run! We had a great time visiting before the race and a great time eating after the race! We had bagels, fruit, donuts and breakfast bars. Naperville North was very helpful. Tim Rinker, a faculty member at the school, was up in the booth and started us off with the song, ?00 Miles! We also would like to thank John Filipiak for his time and for being so accommodating. We had a great deal of support and we were able to give out goody bags to everyone that attended. These bags were filled with gifts and discount coupons from our sponsors! Thank you to everyone who helped make this year a success and we look forward to seeing you next year! Next years date will be decided soon! To the families that have made donations to our foundation in memory of a loved one. Everyone who continues to support and donate to KBMF. 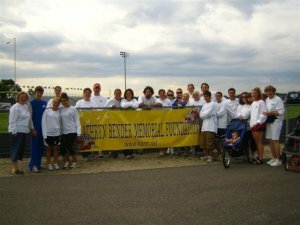 Family members gather around the foundation's banner before the run!